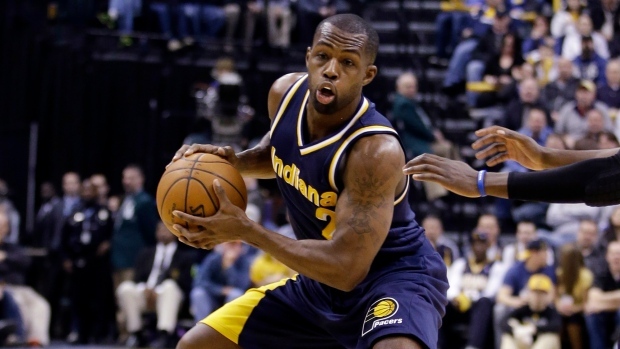 INDIANAPOLIS - Rodney Stuckey is following instructions from Frank Vogel, and Indiana's coach can see it paying off. "I don't know if it's the best he's played in his career, but it's got to be close," Vogel said. Stuckey scored a season-high 34 points with six rebounds and seven assists, and the Pacers beat the Orlando Magic 118-86 on Tuesday night for their sixth straight victory. "I was just shooting the ball," the reserve guard said. "Coach always tells me, 'Shoot when you're open.' They were going in tonight." Damjan Rudez scored 17 points, and Luis Scola added 15 points and 10 rebounds for the surging Pacers (29-34), who moved into sole possession of seventh place in the Eastern Conference. Tobias Harris had 22 points and six rebounds, and Elfrid Payton finished with 14 points for the Magic, who have lost five of seven games. "The shots they were making were tough ones," Harris said. "There were too many times where guys were going right past us. That definitely hurt us tonight." Stuckey made two of his season-best six 3-pointers in an 18-0 run in the first half. Indiana, which beat Orlando for the third time this season, used a 9-3 run in the fourth quarter to pull away, with Solomon Hill's two-handed dunk giving the Pacers a 93-73 lead with 9:52 remaining. The Pacers made 17 3-pointers to match the franchise record. Stuckey was 6 for 9 and Rudez went 5 for 7. "I just wanted to win," Stuckey said. "I knew I was cooking, but at the end of the day it doesn't matter if we didn't get that 'W,' so that was more important." The Magic, who have lost eight straight road games, led 28-20 when Aaron Gordon dunked on an alley-oop pass from Payton. Then Indiana went on its big first-half run, taking the lead for good on a 3-pointer by Rudez and building a 38-28 advantage. He made two more in the third quarter, including one to put the Pacers ahead 71-54 midway through the period. The Magic got back within 11 when Harris made a 3-pointer, but George Hill answered with a 3. Stuckey made a 3-pointer and made three other baskets, including one to give the Pacers an 89-70 lead early in the fourth quarter. Orlando: Starting centre Nikola Vucevic returned after missing two straight games with a sore left ankle. The Magic's leading scorer this season finished with 13 points and five rebounds. Pacers: Stuckey was six points shy of his career high. With the Detroit Pistons, Stuckey scored 40 points against the Chicago Bulls on Dec. 23, 2008. His previous career high for 3-pointers was four, a total he reached three times and most recently against Sacramento in the 2011-12 season. Orlando guard Victor Oladipo was welcomed with cheers from fans when he was introduced in the starting lineup. Oladipo, who finished with 13 points, played three seasons at Indiana University before he was selected No. 2 overall by the Magic in the 2013 draft. Indianapolis Colts linebacker Robert Mathis attended the game and on the first day of NFL free agency, Mathis had a message of his own for fans. When he was shown on the jumbo screen during a timeout in the first half, Mathis mouthed, "I'll be back." The message was well received. Mathis missed all of last season. He first served a four-game suspension for violating the league's drug policy, but before he could return, suffered a season-ending torn Achilles tendon. Magic: Visit Milwaukee on Wednesday. Pacers: Host Milwaukee on Thursday.